Although your life may have seemed like a nightmare before you filed for bankruptcy, you should know that you will face financial challenges after you file for bankruptcy also. However, your life will be easier to manage if you choose to follow your new financial recovery plan. But, you may find that it is more difficult if you are interested in buying a car after bankruptcy. Your credit report will have your bankruptcy listed, and it can stay on your credit report up to a decade. This does not mean that you will not be able to purchase a car; it just means that the process to buy a car will be more complicated and stressful for you. Before you begin searching for a car, you should work on improving your credit score. Also, You should look for lenders who are willing to approve individuals who have filed for bankruptcy. Many lenders will not finance a vehicle to a creditor with a bankruptcy discharge or to someone with bad credit. 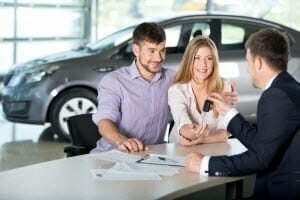 There are some steps that you should follow to make the process of buying a car after bankruptcy a more pleasant experience. A secured credit card differs from an unsecured credit card in that the credit line is equaled to the collateral or deposit that is paid by the applicant. You can reestablish your credit. And, a creditor may also approve you for other types of credit after you have made payments on time. A co-signer is a second applicant on a car loan. The co-signer will guarantee the lender that the loan will be paid on time. Co-signers are typically individuals with very high credit scores. If you default on the loan, the co-signer will be responsible for making the payments. Creditors may approve you for a loan without a co-signer. However, you may have a higher interest rate attached to your loan. It is not uncommon for those with bankruptcies and bad credit to have an interest rate that is 4% to 5% higher than applicants with good credit. These are just a few tips and suggestions to consider when you are ready to begin the process of buying a car after bankruptcy. Having a down payment and waiting a period of time to buy a car after bankruptcy may help you get a lower interest rate and build your credit at the same time. Need to know more about filing for bankruptcy in Georgia? Contact Douglas Jacobson for a free consultation.